What we take with us. In 2013 we started with the idea that hospitality, understood as creating welcoming space, can be transformative. This was particularly significant in developing appreciative, respectful interfaith relationships among students. But we also found that such hospitality is actually a universal means of building relationships and community, providing empowering support for all students. Oasis is a welcoming and enabling community, open to all, contributing to personal and communal spiritual enrichment, while promoting mutual respect and appreciative understanding of diverse religious paths and cultural traditions. What does Oasis do for students? It hosts. What does Oasis do for the University? It collaborates. What does Oasis do for the wider community? It tells its story, it demonstrates with participatory workshops and it conducts rituals and ceremonies by request. We have every indication that the underlying strategy of Oasis has been successful, as students have encountered the unconditional welcome of Oasis. Recognition of success led to the creation of Oasis Ambassadors. Those transformed by the Oasis experience now give impetus to a vision for what might be achieved in the longer term – student leadership across the world committed to the practice and principles of hospitality, learnt informally at Oasis. Accordingly, I believe we are now at the stage when we might recognise that Oasis is a centre engaged in informal learning. How might this role of Oasis be extended in the proposed new Student Hub? Recognition of the significance of informal, extra-curricular learning might take Oasis to a new level in the proposed new Student Hub. However, the University must first recognise and value the significant place of informal learning as complementary to the formal learning process. The edited video below makes a case for valuing informal learning for the 21st Century student. The points I have highlighted in the video suggest how the Oasis paradigm might be extended to provide safe, sanctioned ‘home’ environments that foster informal learning, extending the successes we have achieved over the last 12 months. 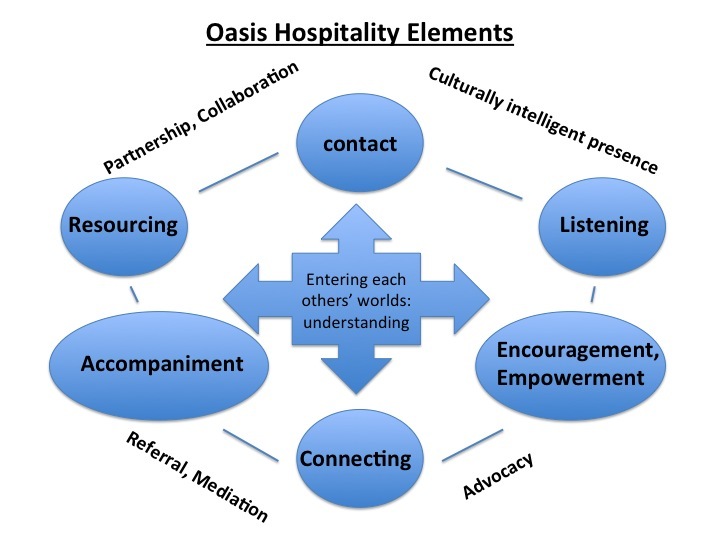 I am suggesting that Oasis, through its practice of hospitality, might provide an empowering ‘home’ environment for informal learning that may go beyond discussion and conversation to creative activity such as digital media, art, music and radio – spaces that provide connection, communication, collaboration and creation. Because Oasis also engages with the wider community, access to its spaces in the proposed new Student Hub is a significant consideration – proximate parking and proximate loading. External spaces linked to the internal spaces of the proposed Student Hub are significant for some cultues and religions. I hope that consideration be given to externally linking Yunggorendi with Oasis to provide outdoor teaching space for Yunggorendi, native vegetation and an outdoor sacred ceremony site, which gives an unobstructed view to the western (sea) horizon. Consideration might also be given to a memorial site within this development. Consideration might also be given to a western-facing balcony area linked with Oasis. It is important that wherever possible, Oasis spaces have windows that look out to the western sea horizon or on to Flinders’ wonderful natural habitat. This entry was posted in Informal Recreational Cultural and Vocational Discussions, institutions, religion and culture and tagged hospitality, informal learning, student hub on March 30, 2014 by Geoff Boyce.